The California harvester ant plays an important role within the desert ecosystem. It has a multitude of interactions with other species, both harmful and beneficial. Predators of Pogonomyrmex californicus include the horned lizard Phrynosoma spp., ant lions, termites, blind snakes, over 25 species of birds, solpugids, beetles, asilids, reduviids, wasps, and a few species of spiders (De Vita 1979; MacMahon et al. 2000). The main reason that P. californicus ant colonies attract so many predators (for example, the red imported fire ant Solenopsis invicta and the Argentine ant Linepithemahumile) is because they are long-lived, sessile, and have many workers (MacMahon et al. 2000). The ant competes with other granivores (seed predators), such as the genera Aphaenogaster, Messor, and Pheidole, for seeds (MacMahon et al. 2000). 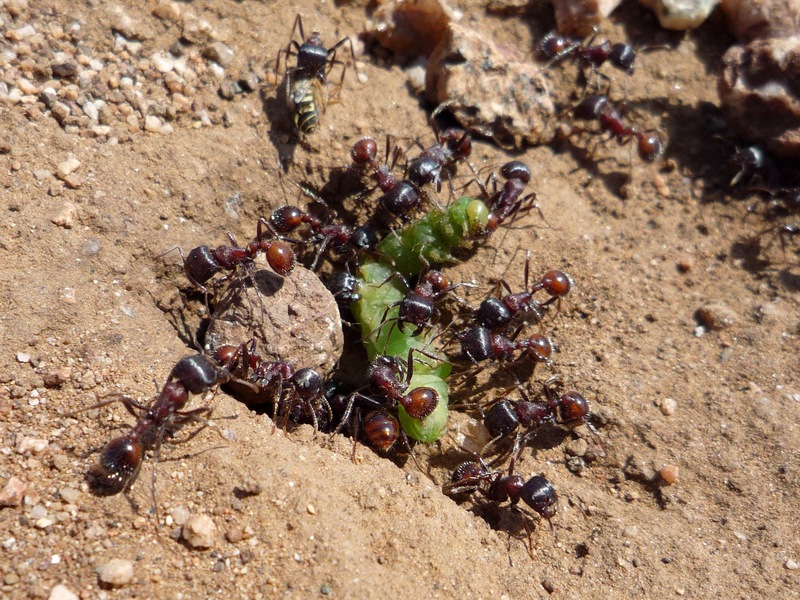 Worker ants collect seeds for food independently of one another by “harvesting” the plants through the usage of their mandibles to cut off the seeds (Navajo Nature 2010). A California harvester ant forager can remove up to 100 percent of the available seeds that it most prefers, causing changes in plants’ community structure by changing the species’ relative abundance (MacMahon et al. 2000). MacMahon et al. also revealed in their 2000 article that a forager alters energy and materials distributions between food webs both above- and below-ground. The energy distribution above-ground is driven mostly by the ingestion of live biomass, and below-ground, the energy distribution is driven primarily by the ingestion of dead biomass; in addition to live biomass being ingested, it can become part of the detrital food web after being moved from the soil surface to below-ground nests (MacMahon et al. 2000). Red harvester ants, such as Pogonomyrmex californicus, were quite important in the religious and medical systems of the native peoples of southern and south-central California as hallucinogens (Groark 1996). Groark researched that they were eaten alive in large amounts so that the people would be unresponsive to external stimuli and experience visions (1996). This finding is quite important in that it is the first well-researched example of an insect being used as a hallucinogenic agent, though it was also taken both internally and externally to treat rheumatism, heavy colds, paralysis, body pain, stomachaches, and many types of gynecological disorders (Groark 1996). Preventative medicine and obtaining euphoria-inducing hallucinogenic effects were not the only reasons for ingesting these ants, however. Supernatural ailments were also believed by the indigenous peoples to be cured through this process (Groark 1996). Groark commented in the same 1996 article that this is because the ants contain venom that can cause a chilling sensation to be felt moving upward from the sting site. Near this sting site can linger intense pain for several hours. It is important to note that only females have the ability to sting, since the apparatus used for stinging is not found in males; the female ant does this by holding tightly to its victim with its mandibles and administering the sting, through which venom is released that contains many different kinds of proteins, enzymes, histamines, and other chemicals (Pogolumina 2010).